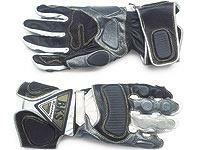 SEE the price tag on the latest BKS GP2000 gloves and you’ll think they’ve put the decimal point in the wrong place. Yes that’s right - £345. For a pair of gloves. No free set of leathers gimmick or nuthin. If you’re the sort of person who can afford such extravagance, you’ll probably say this is the price you pay for uncompromising standards which could make all the difference in a crash. If you’re the sort of person who winces at forking out a ton for a nice pair of gloves, you’ll probably have a slightly different interpretation of BKS’s daring price policy. Whatever, each pair is painstakingly hand-made using only the finest goatskin and calfskin with Kevlar stitching. Rubber pads give impact and abrasion resistance and there are generous wrist and calf fasteners. Expect all-black versions to cost about £300 when the new range is launched at the NEC show, while coloured versions will cost up to £345. Sizes XS-XL. Details: 01395-278861, but be prepared for a waiting list. Really. Poll: How much would you spend to get a decent used bike?